Yet another New Member joins us (right). Bordesley Abbey Lodge and its Master W.Bro.Neil Matthews (right) welcomes our 'New Made Brother'Brother Trevor Stephen Blake (left). Three New Members in our last three Meetings, with another prospective Member due to join us soon. Next years business schedule looks as if it is fully booked already, which can only be more good news for our future. 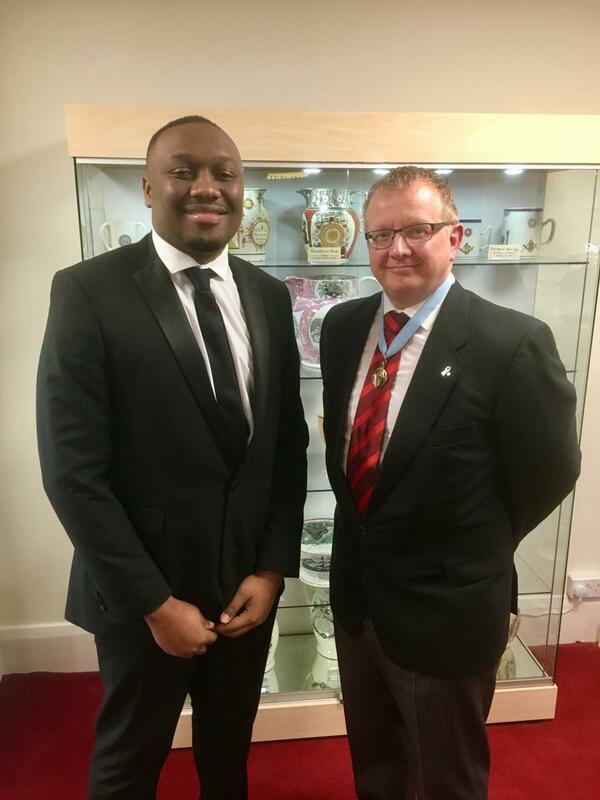 (Left) Bro.Akem Maere (left) with Worshipful Master W.Bro.Neil Matthews. We welcome Bro. Akem Maere to Bordesley Abbey Lodge, another New Member. Bro.Akem is a very talented addition to our Lodge and will be well received by all concerned. 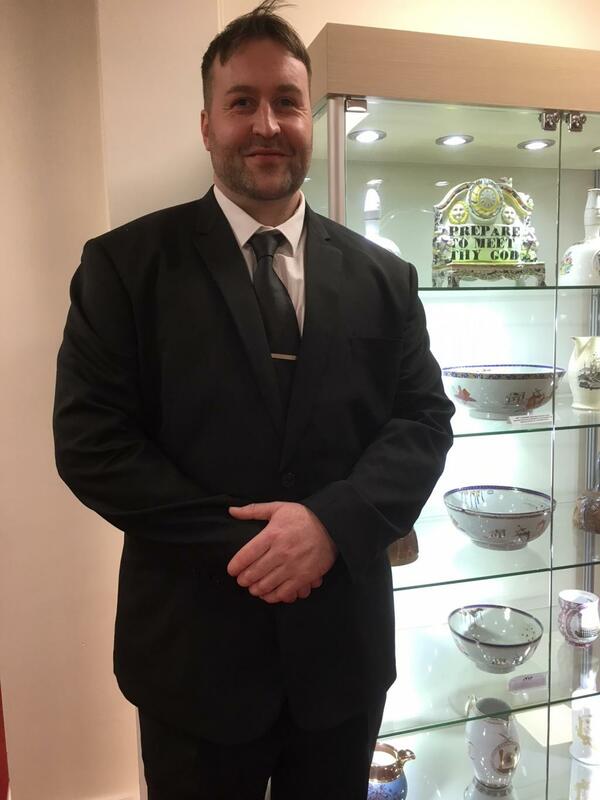 Paul is a Re-Joining Member of Bordesley Abbey Lodge. Great to have you back Paul, we have missed you, but work must come first. We wish you a long and happy Masonic future here in Redditch. Welcome to Bro.James Andrews, our newest recruit. Bro.James, it's so good to have you aboard. Welcome to Bordesley Abbey Lodge and the start of your Masonic career, we hope that you have many enjoyable and rewarding years with us. 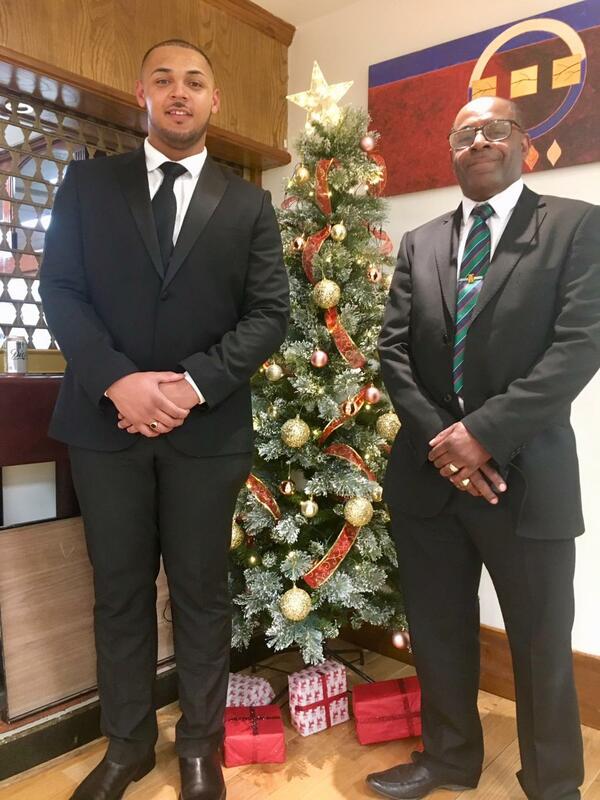 (Right) Welcome to Bro.Omar Dennis another recent addition to Bordesley Abbey Lodge. Congratulations to Bro.Omar Dennis on becoming another recent addition the the Bordesley Abbey ranks. Here Bro.Omar is seen (Left), flanked by his very proud father (Right) Bro.Dalton Dennis. Bro.Dennis (Snr) fulfilled a pivotal role during his son's Initiation. Both Omar & Dalton both travel a considerable distance to join us at our regular monthly meetings. If any Member is thinking of starting a football team, then Bro.Omar is your man. 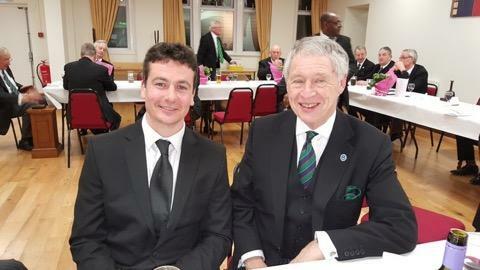 Congratulations to Bro.Jack Mc.Dill (left) on becoming a recent Member of Bordesley Abbey Lodge.Bro.Jack was joined at his Initiation by his Father & Brother who both travelled from their respective Lodge's to be with us all at his Initiation and make it a very special evening. Seen in the photograph (L-R) are Brother Jack Mc.Dill and our Right Worshipful Provincial Grand Master Robert C. Vaughan. Bordesley Abbey Lodge now has its own facebook Group Page and hopefully those Members who have Internet access will feel encouraged to make full use of it. In addition to our installed Stairlift and our Inductive Loop in our Temple & Dining Area, we now have installed at the base of our rear stairwell, an AED Defibrillator. All our Lodge's have had selected Members trained in its use. 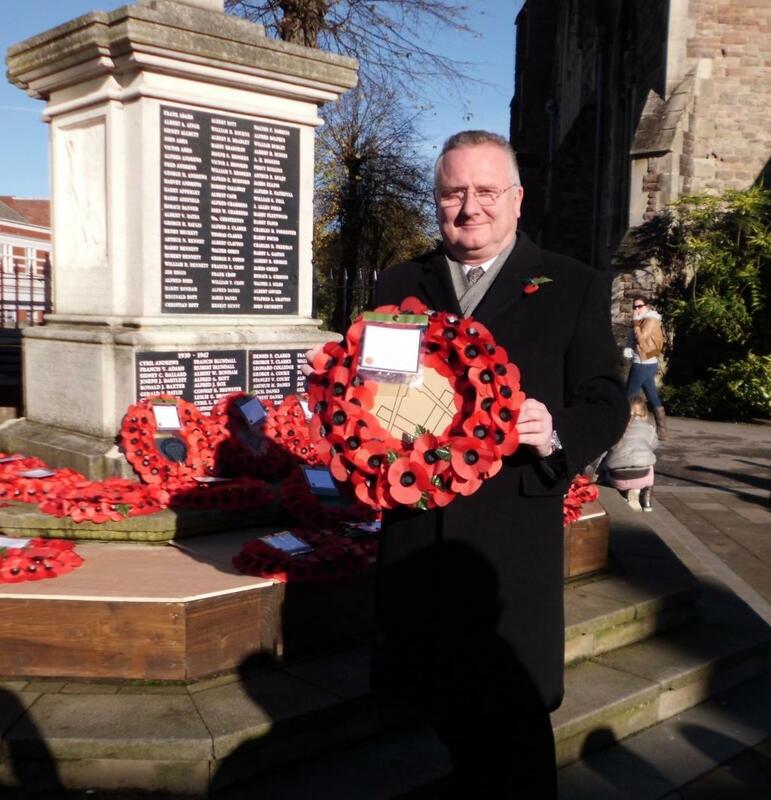 Among those who were present at this year's Armistace Day Remembrance Ceremony held at St.Stephen's Church Redditch on Sunday 10th November 2013 were Worshipful Brother John Rice - Worshipful Master of Bordesley Abbey Lodge No.4495. 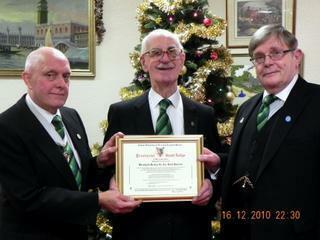 Worshipful Brother John (seen left) was representing 'The Reddich Masonic Charity Organisation'. 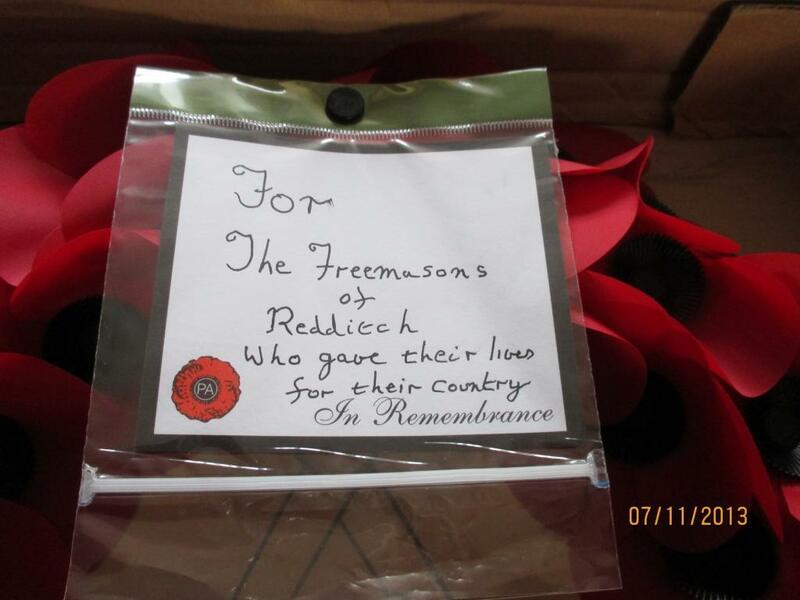 The presentation was made in the form of a wreath (seen right) which was presened on behalf of all Redditch Masons in Memory of All Those Redditch Mason's who had made the 'Supreme Sacrific' in past conflicts on behalf of our Queen & Country. Visit to a local 'State of The Art Eco-Brewery' heralded a great success. 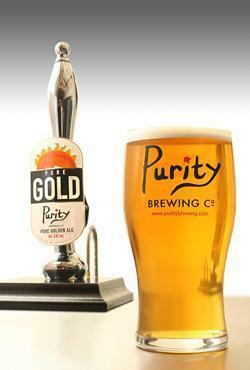 A tour of the 'Purity Brewing Company' our local Eco-Brewery at nearby Great Alne, Studley was arranged for Members of the Lodge & their Guests on the evening of Thursday June 7th 2012. The tour consisted of a guided tour of the 'State-of-The-Art' brew plant and environmentally-friendly water treatment system. A fresh farm-cooked meal was also provided in the purpose-built Visitor Centre, Members & their Guests also had the opportunity to sample some of Purity Breweries beers. Tea, coffee & soft drinks were available for drivers, vegetarians were also well catered for and of course a much prized * FREE * Purity-branded glass was provided for each guest. Having such an excellent 'Eco-Brewery' on our doorstep is truly a wonderful feature and no doubt a great source of pride for all who are employed on the site. The trip was heralded a great success by all who attended and our thanks must go to the 'Purity Brewing Company', their Staff and Lodge Members for arranging such an excellent evening. 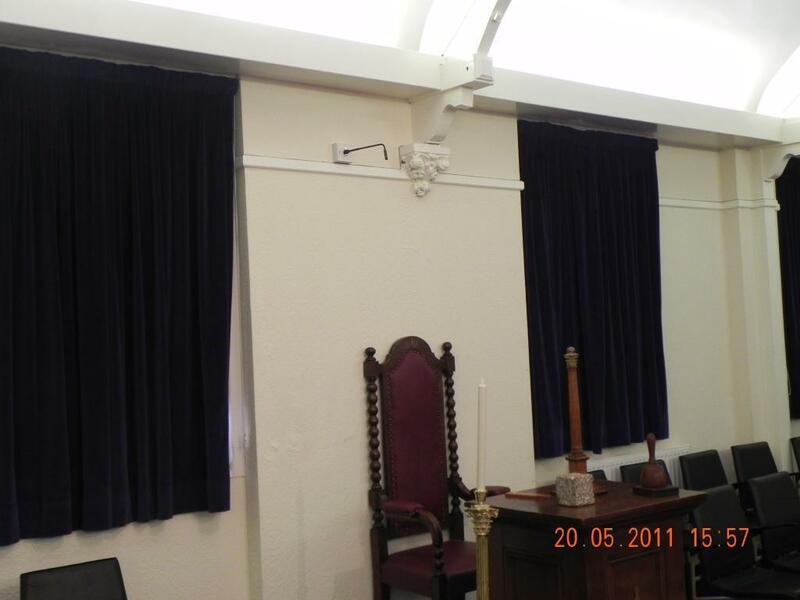 Any Bordesley Abbey or other Lodge Member with hearing difficulties may now be able to enjoy their Masonry to the full, thanks to the recent inclusion of a 'State of The Art' Inductive Loop System which has been recently installed in our Hall. For those not conversant with the technology & theory behind 'Inductive Loop Systems' the following should explain all. Basically speaking, an 'Inductive Loop System' works on the same principle as your cordless re-chargeable toothbr ush, that is, two coils of wire, one with the transmitted signal inducing an d.c. (direct current) e.m.f. (electromotive force) and its associated magnetic field, which is 'picked up' by a receiveing coil. In the case of the cordless re-chargeable toothbrush, the transmitting coil is in the base charger and transmits energy in the form of a magnetic field contactlessly, to the coil in the toothbrush itself, thence re-charging the internal re-chargeable batteries, where as, in the case of an Inductive Loop System, the transmitting coil is located around the periphery of the room in which sound coverage is required and the receiving coil is the coil internally located in the listeners hearing aid , still with me? perfect, you now know all there is to know about 'Inductive Loop Systems', and perhaps Cordless Re-chargeable Toothbrushes also. The transmitting coil in our Temple encompasses the main Temple and the Ante room to the South, which is used by Rose Coix and is at skirting level. (see above) The inputted signal is derived from 4 fixed wall-mounted microphones located above the WM, SW, JW (see below) and Secretary, there is also the facility to utilise up to 4 tie-clip radio microphones when Charges, Tracing Boards, Address's, or walking/remote audio needs to be addressed. All the coontrols are adjusted for maximum effect, all that is required is to turn the system 'On'. In the dining area all the electronics hardware including the Inductive Loop, Loop, are located above the suspended ceiling and the only visible items of hardware are the mains supply located by the windows and up to 2 table top radio microphones and 1 tie-clip microphone that would typically be located by the WM and either Charity Steward, presenter of Toasts, Chaplain or other remote source of audio. The tie-clip microphone is in addition to the 2 table-top microphones and adds additional flexibility. 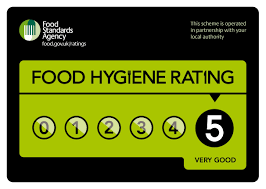 Overall the system has been financed by the Hall Management Committee and the Province of Worcestershire, for which we are very grateful, lets hope that we can obtain additional funding from additional sources. 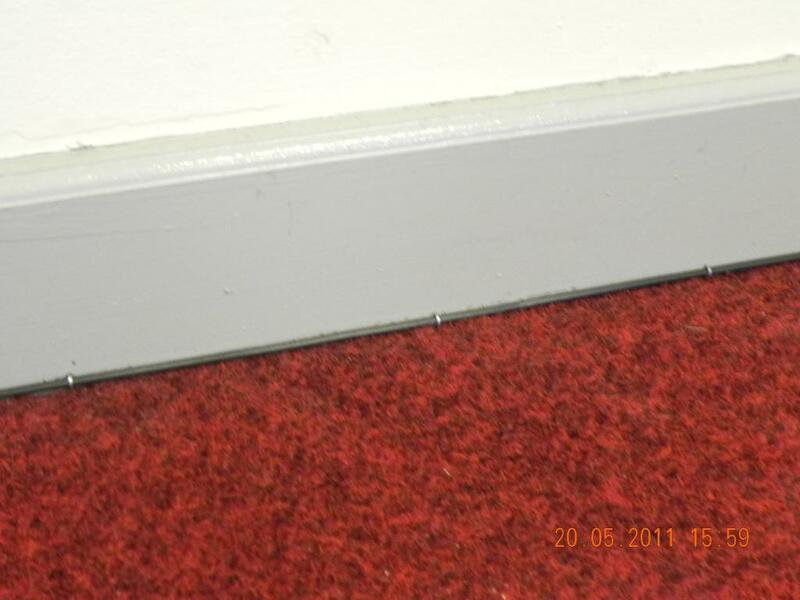 The System should require no maintenance and hopefully will be of great benefit to all Redditch Masons who have some degree of hearing loss, we look forward to any comment or feedback regarding our new Inductive Loop System. they're not going anywhere !........" 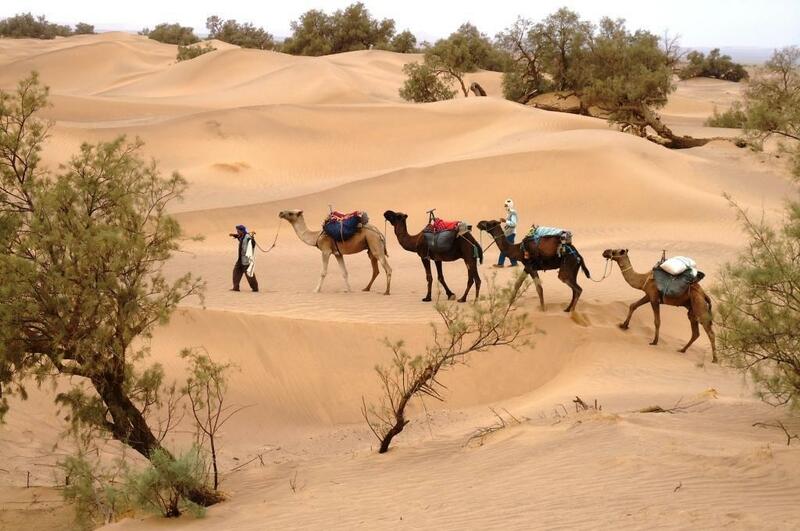 And now at last a brief report on Bro.Grayston Nixons Sahara Trek. Bro.Grayston it would seem is not just ontent with donating to a very worthy charitable cause, but it would seem that he insists on making what could be a simple straightforward procedure, not only difficult but arduous, fatiguing and mentally exhausting. 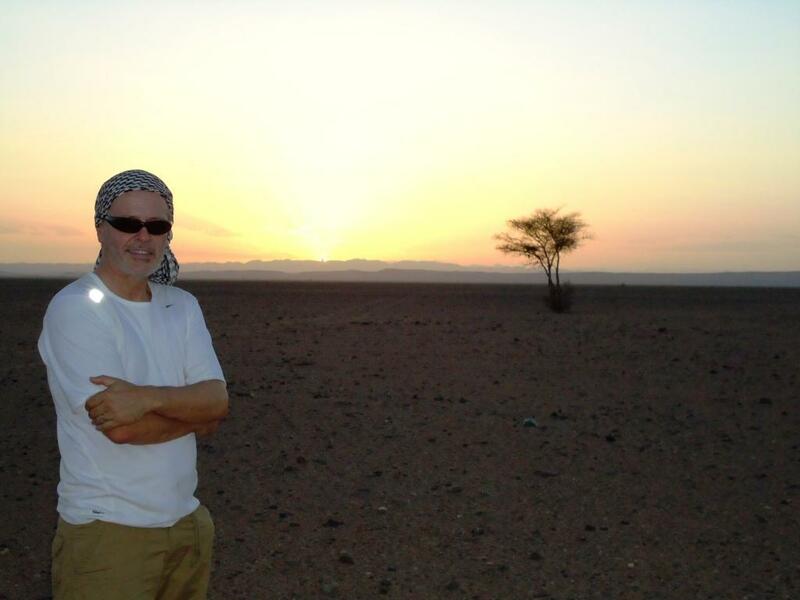 Bro.Grayston recently spent eight days trekking across the Sahara from 6am to 4pm with only 90 minutes break at midday, unlike his often lengthy business lunches no doubt? Bro.Grayston commented that “The terrain varied from shale to hard baked sand to rock strewn to sand dunes, all with their own degrees of difficulty, but the dunes where the hardest – in places you sank to your knees and the sand was HOT!!!”. Still it was a dessert after all Grayston…. The basic rations were cooked by Berber support crew and consisted of bread, coffee & cheese for breakfast, bread, water & cheese for lunch, meat, vegetables, coffee & water for dinner. Although the term ‘meat’ was listed in the daily menu, Bro.Grayston recalls that he was not exactly sure of the species or the cuts offered and added that, “most obscure were the Kid Brains – we all thought they were an egg dish!”. Bro.Grayston's lasting impressions following the trek, were of complete darkness and the night sky, “it was incredible just to lie on your back and just see so much (whilst picking bugs out of your sleeping bag) –complete silence at night – 360 degree landscape with nothing but sand and no points to gauge any distances walked, also, how precious water is and how good a shower is!”. Would he do it again? “Yes, of course I would”commented the Triumphant Trekker “but the next time my ‘Little Blue Book’ comes with me, I will insist on that. Bro.Grayston raised in total £5,000 for Acorns Children’s Hospice Trust – Well done, a magnificent achievement Brother Grayston! 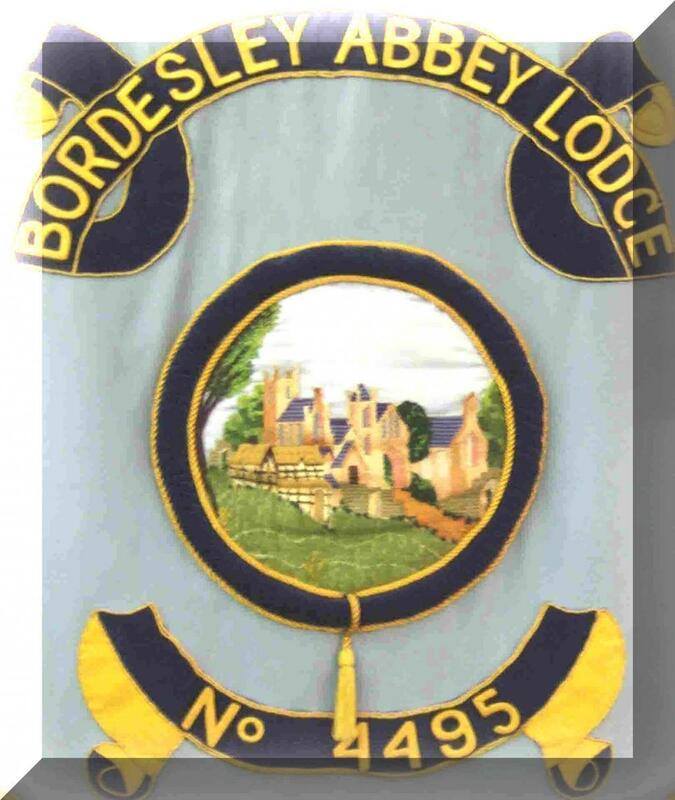 Bordesley Abbey Lodge No.4495 hosted a momentous event at Redditch at its December Meeting, when W.Bro.Lt.Col.David Paterson, M.Sc., P.P.J.G.W. celebrated his 50 years in Craft Masonry. W.Bro.R.L.Nash., TD. P.P.S.G.W. informed the Lodge of the very distinguished military career and Masonic life of W.Bro. David. W.Bro.David's early life started in Scotland, where his Masonic life began in a Military Lodge where he was first Initiated into Freemasonry. He was afterwards Passed and Raised in Bombay whilst serving with his Regiment in India. 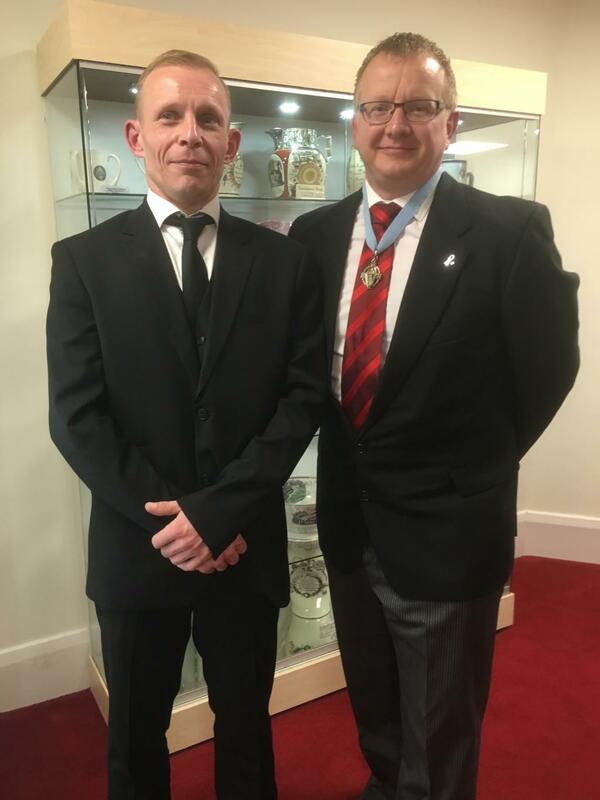 Since those days, W.Bro.David has embraced a large number of side orders including Royal Arch, Knight’s Templar, Mark Masonry, Order of Secret Monitor, Rose Croix, Royal Order of Scotland and last year took the chair of ‘Desired Haven Lodge No. 5948’. He has given an enormous amount to Masonry in the last 50 years and his total dedication, his attention to detail, his sense of service and his administration skills forged all those years ago in Scotland have always stood him and the various lodges he has served in good stead. Following W.Bro.Nash's address, W.Bro.C.V.Young, P.S.G.D. representing The Right Worshipful Provincial Grand Master then presented W.Bro.David with his Certificate marking 50yrs service to Masonry. (see right) The Master of Bordesley Abbey Lodge, W.Bro.E.P.Lee, P.P.G.Reg., P.P.G.Swd.B. (Warks) then closed the lodge to allow good fellowship to be enjoyed over a traditional Christmas Fayre. (Seen left to right: W.Bro.E.P.Lee - Worshipful Master, W.Bro.Lt.Col.David Paterson, W.Bro.C.V.Young - Assistant Provincial Grand Master). On 25th January 2007 Bordesley Abbey Lodge celebrated its 500th meeting, but it was a double celebration as it was also 60 years ago that Worshipful Brother Alan Wright (seen below) was initiated into Masonry. The Worshipful Master Keith Childress introduced Worshipful Brother Derek Lewin who spoke in-depth of Worshipful Brother Alan’s six decades of distinguished service to Redditch and Worcestershire Masonry;this was followed by a fascinating response from Worshipful Brother Alan detailing his personal and Masonic career which proved a great ‘hit’ with the Brethren. 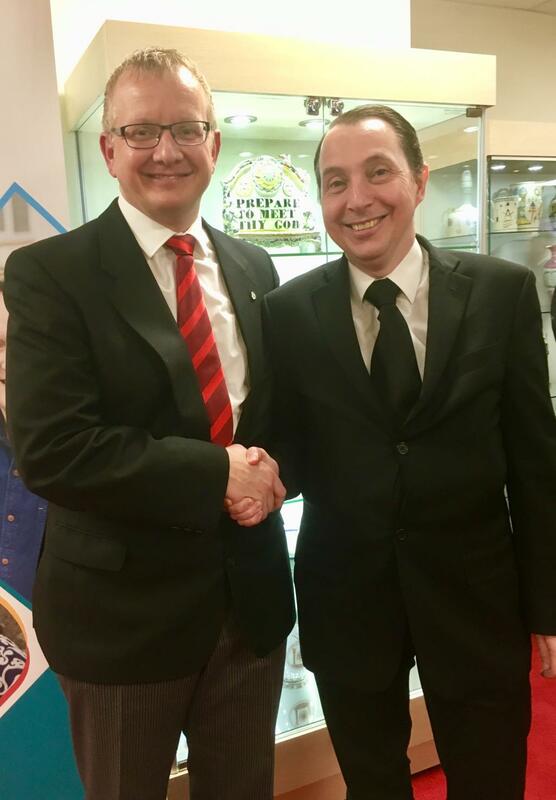 A spokesman from Bordesley Abbey Lodge commented that “Worshipful Brother Alan is very much an active member of The Lodge, a true credit to Bordesley Abbey Lodge and is most certainly a very fine example to us all”. The celebration was welcomed by the presence of The Provincial Grand Master The Right Worshipful Brother Richard G.H.Goddard M.A. 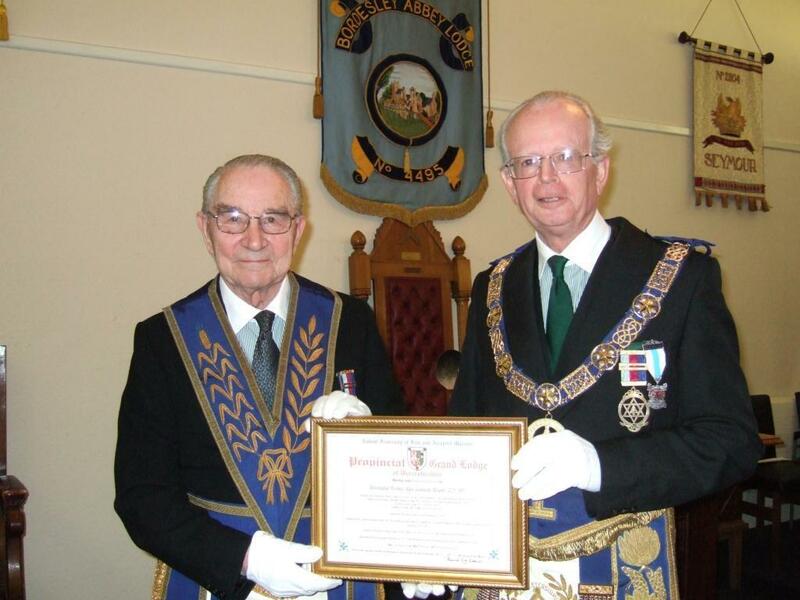 who is seen (above) presenting a ‘Grand Lodge 60 Year Certificate of Merit’ to Worshipful Brother Alan Granville Wright T.D., J.P., P.A.G.D.C. and thanking him for his continued commitment to Masonry. The Festive board drew a large gathering of both Bordesley Abbey Brethren and visiting Brethren who were keen on joining in the never to be repeated ‘Double Celebration’. Finally, all members of the Lodge and Visiting Brethren were presented with a suitably engraved, limited edition Staffordshire Crystal Tumbler as a memento of this landmark event. Want to make 'The News' ? Had a new addition to the family? celebrating an anniversary? or even planning to sail up the Limpopo in a hip-bath? then please send your 'News Item' to your WebMaster, complete with any images you may have.